Thai Coconut Red Curry is healthier and tastier than your favorite takeout dish and is ready in just 15 minutes! Loaded with nutritious vegetables and served with brown rice. I used to think that I didn't like Thai food because I kept ordering the wrong thing. Then, I went to a Thai restaurant with a friend and they told me what to get- a red curry. I was nervous because I had not liked other dishes that I had ordered in the past but I knew to trust their suggestion. They were right! It was so good! Ever since that day at the Thai restaurant, I have stuck to red curry dishes every time I go to a Thai restaurant because it is my favorite thing ever. As much as I cook at home, I had never made homemade Thai food until now. I thought that it would have a ton of ingredients that I am unfamiliar with but it only had two ingredients that I do not regularly stock: coconut milk and red curry paste. It was time to give homemade red curry a try. Well my friends, it turned out delicious and I will now be making my own at home all the time. So easy! I got most of the vegetables that I needed for this recipe at a local farmer's market here in the Metro Detroit area called the Dodge Park Farmer's Market. I love visiting farmer's markets all summer long and was excited to check out this one. They had a great selection and plenty of fresh produce options. Shopping in-season is the way to go because your produce will taste so fresh that way. 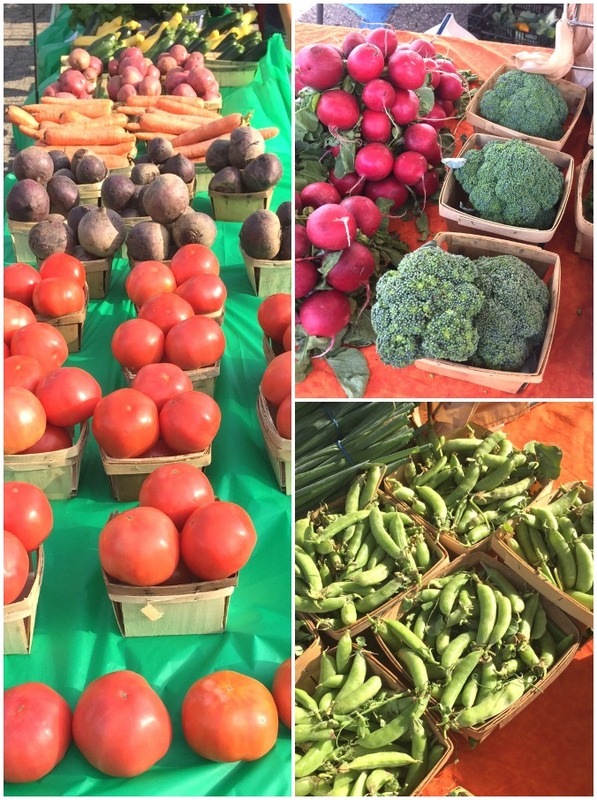 We regularly visit Eastern Market for our produce and this was my first time at the Dodge Park Farmer's Market. It is open before a free concert that we like to go to on Thursdays in the summer which is really fun. Buying some produce and watching a concert in the same location is my definition of a good time. It is a great location for a farmer's market with plenty of in-season produce options. They also have a lot of other foods such as popcorn, a pizza food truck, banana bread and other breads and more. I love getting my produce at a farmer's market because it is so fresh and delicious! Make sure you wash all of your produce at home before cooking with it and then dry with a clean paper towel. Find a Farmers Market in Michigan here and sign up for the Michigan Farmers Market Shopper e-newsletter for information on seasonal recipes, events and shopping guides. 1. Heat oil in a large pan. Add the carrots, zucchini and garlic. Cook for about 3 minutes. Add the rest of the vegetables and cook for about 2 minutes until vegetables are softened but still a bit firm. 2. Stir in the curry paste and coconut milk. Simmer for about 5 minutes. 3. Turn off heat and stir in lime juice. 4. Serve curry with brown rice. Enjoy!